American Roulette is one of the most popular forms of Roulette if not the most popular both at online Casinos and at real Casinos worldwide. The simplicity and general ease of the game coupled with the potential for incredible earnings have made this a staple at Casinos for a long time and will continue to be a Casino favorite. You will be able to find American Roulette at basically every Casino there is. And in this article we will go over many things about American Roulette to help you understand all there is to know about it: How to Play Where to play for both Americans and Non-Americans, Odds, House Advantage, Bets list and some of the variations of American Roulette available and what makes them different from the standard version. Roulette is basically you , the player, guessing where the ball will land. You can bet that the ball will land on a specific number, group of numbers, color(black or red), Odd or Even number and you can even bet on that the ball will land on one of the two “zero” slots on the wheel. Your first step is to place your bet. You do so by place your desired betting amount, usually a chip with a dollar figure on it, on the board with the corresponding number, color or whatever you have chosen. You can place as many bets as you would like from the table minimum right up until you reach the table maximum. So for this example we will be placing a $50 bet on the color red. After the wheel has finished spinning and the ball lands on the number 14. Well the number 14 is red so you win simple as that. But you also would have one if you were to have bet on: the number 14, the 2nd 12 option, Even or the 1 -18 group. Each bet would pay out differently based on the odds that are associated with each number. I am going to suggest two different casinos here one for Americans and the other for Non Americans because some Casinos don’t allow people to play there based on their location. The best place to play American Roulette for Non-American players is at White Knight Casino (Not available to Americans, but check out Roulette 5 at WinADay Casino instead.). They offer lots of different variations of Roulette including: American Roulette, Hot Streak Bonus Roulette, Multi Wheel Roulette Gold and Premier Roulette Diamond Edition. The best thing about White Knight Casino is they offer a Mobile version of American Roulette. So you can play and win from your phone no matter where you are. Of course, players outside the USA can still take advantage of that $10 no deposit bonus at Classy Coin Casino: (Closed down - Americans we recommend WinADay, everyone else we recommend Video Slots). There are many different types of bets to make in American Roulette. And below we will go over them and explain them to you. The American Roulette wheel has 38 slots, 1-36 plus 0 and 00, to which the ball can land in. Your goal is to guess where the ball will land by placing bets on the corresponding numbers marked on the table. Numbers, colors, odd number or even number are among the many options you can bet on in American roulette. Start by selecting the amount you want to bet for the first spin, the amounts available to bet are marked on the chips placed out in front of you. You may bet anywhere from the table minimum to the table maximum. By choosing a chip amount, you’ll notice under the spinning roulette wheel it shows you how much you are betting per bet, to take away from the amount, simply click the stack of chips to lower the betting amount a little or continue clicking until it shows zero to set the betting amount back to zero. On the left side of screen is a box displaying how much the inside and outside minimum and maximum bets are, also you current funds. Once determining how much to bet, choose where to bet by clicking on the table, if you hover your mouse over any place to bet, the table will highlight which number/numbers your betting, for example, if you hover over red, all red numbers on table will be highlighted. Once you have clicked and placed a bet you’ll notice that a chip or chips will appear on the table where you clicked. To reset you bets for this round, click clear all and you may start over again. When ready click spin, once the ball stops spinning and lands in a slot, the winning number appears in the top right corner. If you guessed correctly, you win. To repeat the same bet for the next round, choose the repeat option, if you would like to bet differently, just click where you would like to bet and continue as normal. In the top right, beside where the current winning number is displayed, is a list of the previous winning numbers and their color, use this to help you see if a number or group of numbers are on a streak, are due or just use as a reference. There are many different Variations for each version of Roulette. We will go over just some of the many amazing ways to that you can enjoy American Roulette. 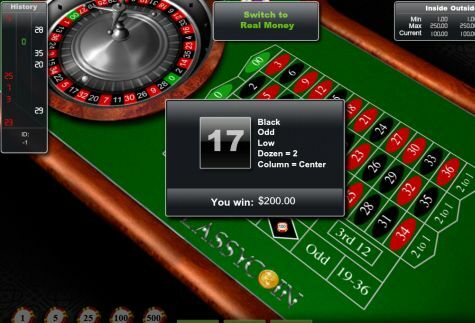 All of these games follow the same basic rules of American Roulette and we will tell you what makes each variation different from standard American Roulette and where you can play each version. Multiplayer Roulette follows the same rules as standard American Roulette the obvious difference being the ability to play with more than one person. This adds to the excitement of American Roulette by adding in the competitiveness of playing against other players. You can choose your avatar and screen alias. If you see some other player is having success you can copy their strategy or avoid an unsuccessful one completely. This Cool variation of American Roulette is available at Classy Coin Casino: (Closed down - Americans we recommend WinADay, everyone else we recommend Video Slots). This variation of American Roulette is the same as all others except that the graphics are in 3D so it makes it easier to look at when getting into a nice long session. Visually this game looks amazing and when the normal above view gets boring than you should head to Omni Casino (Not available to Americans, but check out Roulette 5 at WinADay Casino instead.) and give this version a try.